Thanks for contacting SmugMug. Sure, let me help you with your question. Please let me assure you that your photos are safe. The volume of migration has been high and might take a while, and some photos might take longer to appear in your SmugMug account, so just please give it a bit of time. ​In reviewing your account I see that you've received a notification that migration is complete. We have some instances we are reviewing where files did not transfer to your SmugMug account and have instead transferred to your download file page. While we look into this, we appreciate your patience. Now two days ago. Yikes. For the most part the migrations have gone well with little hiccups but in some rare cases we've experienced items that would pause the migration of an account and need the attention of our engineers. We're working through each of those as fast as we can. It's possible your account was mostly migrated but a few items need our attention. Would you mind providing me with a link to your SmugMug account and I can dig deeper into what's going on? The web address is http://troop14.smugmug.com. Is that sufficient for you to look into the problems? I dove into your account and see that there were in fact a large number of photos that weren't able to migrate when we initially attempted to bring your photos to SmugMug. They're still safe and secure and we're working on getting these photos brought over as well. Since so many of your fellow Phanfare friends have chosen to move their photos to SmugMug it may take a few more days for us to get the remaining photos into your account. I've made sure you're on the list of customers that our Support Heroes will contact once we've moved the rest of your photos to SmugMug. Just curious - I don't believe there is anything special or different about my photos. Can you let us know what caused the hiccup? I have the same problem. The original transfer started on April 13 and received an email to confirm it has been completed by April 16. But since then nothing happened, I am missing 1156 pictures, they are aware of it but nothing happened since then. I know Smugmug is telling me to be patient but I am afraid I won't have time to validate against my phanfare account while it is still active (As I am going away soon). Also I want to make sure that they will advise me when these pictures will be transferred. I understand that there are a lot of transfers going on and the team at Smugmug are doing their best but I don't want to lose my pictures. We don't want you to lose your memories either. Our engineers and quality support staff worked very hard with Phanfares to test the migrations before we launched this but sometimes a controlled test doesn't always catch the hard to find items and there were a few scenarious where our initial request to transfer resulted in an error. We're working as fast as we can to requeue them. We'll make sure all the photos are transferred or marked in the Downloada section before anything happens to them. This is so reassuring to read. I also have blank albums and files that indicated they needed a manual download but that didn't work. I emailed carbonite but looks like SmugMug will be the ones to help in the end. I just checked in with the heroes. They say that the engineers are going through each account that had problems and things are just taking longer than expected. They couldn't provide an estimate of when things would be fixed. We're still a month away from the Phanfare shutdown so no need to worry yet. I will be away starting next week and I won't have time to do this. When I come back I will not have access to my Phanfare account anymore so yes I am worry. Last weekend I passed hours to sort manually my pictures within the gallery for the completed albums, it takes a lot of time but I still have some albums missing pictures (1156). I understand that they are busy and trying to do their best to resolve the problems but I don't have a month like Smugmug. I haven't detected cases of missing albums. In fact, my account settings stats regarding the size of the transfer are 2x higher than my Phanfare content suggesting most of my folders have been transferred twice. Because the SM transfer process grabbed both my highest level album (all folders) and sub-sites (sub-sets of the album content)? BTW, although my transfer appears by inspection to be complete the message on my homepage indicates it's still in process. Yet my account stats haven't been updated for ca. 4 days. We had an issue with stats processing over the last week that should have resolved itself a few hours ago. Please let us know if you don't see any stats counts. Just checked my account stats, the counter has not changed since April 16 (3606). How do you see the msg. 'It's in process' on your homepage? Do I need to setup something? Just want to clarify about the missing pictures: all my album entries are there, some of them are completed but within some of them I am missing pictures. When you said "stats" I thought you meant your "Account Statistics" which shows how many people have viewed your photos -- my apologies, you just meant the # of photos listed as uploaded to your account. During the migration a number of photos may have been flagged as an error for one of a few reasons. We have all of the errors sorted out but grabbing them and putting them into your account may take a few more days. They're safe and nothing will happen to them and one of the Support Heroes will contact you when they've been put into your SmugMug Account. Just going through a few albums from 2004 - 2007, I am up to over 1600 images (not videos) - and I have only been through 7 or so albums - that were not imported into SmugMug. These are jpg files. Videos are even worse. After the "complete" message the list of failed items was large (1800), 99% being videos ranging from .MOVs to .AVIs with a few older .3GPs. I tried to upload some of the MOVs as those are the most important from a preserve family memories standpoint and even with the direct upload to SmugMug, those failed. I can get the .3GPs (kind of) but .MOVs? Then add on the 'bug' that at least I encountered of if you had multiple Phanfare sites and albums crossed multiple sites, you had duplicates of all the albums - in some cases I have 6 copies of the same albums. SmugMug supports answer is to download from Phanfare. That doesn't solve either getting Amazon's S3 redundancy nor the display of the content. Then add on top of that I have 815Gb of photos and videos, that would take a large amount of time off a residential connection and I can't really use the corporate fiber for that. Subsites are folders on SmugMug, and albums are galleries. If an album is on multiple subsites, we will try to mimic that by creating relevant galleries, storing the photos in one only, then collect them into other galleries so they basically show in several galleries. Based on your observation, those photos are being duplicated, not stored in one gallery and shown in others? I'm not sure how that works on SmugMug. Is it possible that you see them in multiple places, but they all point back to the same source gallery? I might want to make a few more changes on the Phanfare side before my migration if your duplicate observations hold true. A few early migrations exhibited some odd behavior when a photo was in multiple sites but since then we've repaired the issue and these photos are stored in 1 gallery and then "collected" to the other ones. Essentially they're all "virtual copies". Same issue here. Phanfare site vijar.phanfare.com. I had panic attack after discovering how many photos were missing after migration was complete. I tried visiting your Phanfare site and got "bad parameter." I'm not sure what's up with that. I'm going to start my Phanfare -> SmugMug transfer this weekend. I'm just going to hope for the best. I, too, don't have much time and am not happy with the short notice from Carbonite. I've tried to clean up a few things on the Phanfare side in hopes of a little better migration. I appreciate others sharing their experiences here. The only cloud migration I've ever found is SmugMug's Smugglr utility in Firefox. Despite some bad reviews, I found it worked pretty well and works fairly quickly because the transfer is cloud to cloud. I had previously migrated my content on Phanfare (1950-2014) via Smugglr. The main problem I found is that it didn't carry over section descriptions. I'm hoping the new transfer tool works better in this department. It's worth a try to see if that does a better migration on some albums than the current "Death of Phanfare Migration" tool they have now. You have to do it on an album-by-album basis and you don't have a lot of time left to do it. If you can get your content on SmugMug, you seem to have decent options for migrating to other cloud services. I previously mentioned UploadJunction and I think I've seen others. SmugMug seems to be big enough that others go to the expense of connecting to the SmugMug API. The only other option I see is to download your content and then re-upload it to another cloud provider. You can try using the Phanfare download tool that they created when Carbonite bought Phanfare. I've seen some people post links to it. I don't know how long it will take you to do that, and then you'll have to upload to another site. You could try ordering DVDs of your Phanfare library from Carbonite. I don't know if they'll provide that service if I tried purchasing it or not. I checked the price on my Phanfare account and it was going to be ~$500 to dump all my stuff on DVD. I don't think I'm going to do that, but was curious about the option. Migratr is another tool (http://www.callingshotgun.net/about/migratr/). It does connect to Phanfare, but it hasn't been touched in years and I don't know if it even works anymore. Also, from what I can tell, Migratr doesn't work in the cloud. I think it just automates the manual download/upload process and that path of your photos would be Phanfare --> Computer --> Where you Migrate To, so it's going to be limited to your bandwidth and disk space. If you're the programmer type, you could try the Phanfare API and write your own. You don't have a lot of time to get it done right, though. You'd also need to get an API key from Carbonite, and they probably won't give you one at this point. I got one a few years ago (with disclaimers that they don't support API integration anymore), thinking I might create my own utility, but I have a real job and a family and didn't have time to work on that project. But, if you have time on your hands, maybe you could give it a try. Maybe there's something in my experience that will be helpful to you, but I don't think you have many good options. So I'm beginning to get worried since the missing photos have not shown up in my SmugMug account and I haven't received any emails from SmugMug providing a status update. Should I be trying to fix things on my own? I have new pictures I want to add to my site but have been holding off waiting for the migration to be completed/corrected. If you could send me a private message with your email address on your SmugMug account I can dive into this for you. I foolishly deleted the folders that had been created from my original subsites as everything appeared to be duplicated. But that has left the duplicated folders empty. So I have a bunch of albums from Phanfare that I need to re-migrate in. I just downloaded Smugglr but its not recognising my Phanfare password so wont let me continue. I clicked on the Migratr link and went to its website and clicked on the two different download links and both go to a 404 page. Oh man I really buggared it up. I have lost heaps - thousands. All I have now is folder names with blank images with the collection arrow on them - but no actual images. Is there a way for staff to re-migrate a batch if I give them the album names ? Actually its seems weirder than just deleting subsites as some didnt have a sub site to begin with. What I did today was create some new folders and moved some existing galleries into those folders. I did that via the clicking and dragging on the left side of the organiser. Now when I view those galleries they are either empty or they have black squares with the collections arrow. These galleries were all full at the point that I dragged them into the new folder. Something has happened and its just killed about 3 weeks worth of work doing all my side by side comparison work to rebuild each gallery in the exact order I had it. There is no way I will have time to recreate all that before 28 May I could seriously cry right now. I dont think this is something I did. Basically I have spent weeks checking every single gallery to ensure its contents matched the original Phanfare album/section. Then dragging everything into chronological order etc. Today all I actually did was to create a new folder to drag a group of galleries into. Everything looked normal when I did that. A few hours later when I clicked on one of the galleries it was showing as empty - with the words "This gallery needs photos". As I then started clicking on each gallery - some have that message, some have photos in them, and some have the black squares with collected arrow symbol. Every single gallery was full of photos prior to me dragging those galleries into the new folder. Just now I opened the phone ap. Every gallery looked fine and full of photos. But when I went out of a gallery and back into it - the photos disappeared in front of my eyes. So I am not entirely convinced I have made a booboo here. What on earth has happened and how can it be resolved ? Could it be that I originally had galleries in folders - then I moved a folder into the new folder ? Can folders contain folders ? Yes, folders can have folders. My site is pretty much flat - one folder with lots of galleries - with the exception of the Travel Folder. In that folder I have folders within folders. 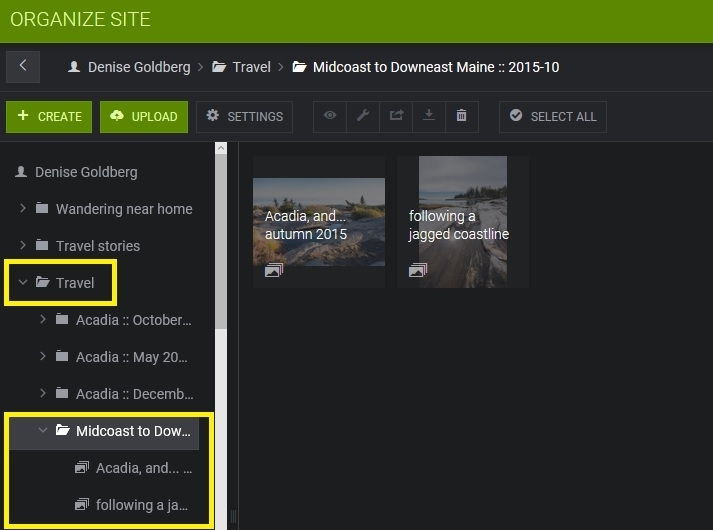 For example, in the top-level Travel folder I have a folder titled Midcoast to Downeast Maine :: 2015. Click that folder to open and you will see 2 galleries. Ok yes that is what mine looks like then - folders within folders. But moving them into the main new folder has done something terrible with all the content. I have lost thousands of images. OK so I logged out of Smug for the night in the hope that whatever happened has resolved itself - but nope everything - thousands of images - are missing now. Everything was there in each gallery and folder perfectly fine. Then I created a new folder and dragged them all into it. Now everything is missing. Some galleries have photos, some are empty and some have the black squares with e collection arrow. How can I get this restored so I still have time to re-compare and sort etc before 28 May - this has killed 3 weeks of solid work I was in tears for hours yesterday. Could you send me a few examples of galleries/photos that disappeared? Links to a folder/gallery or two, with a description of what should be in them but isn't. I don't see any photos or galleries being deleted that would cause anything to disappear. A lot of site organization is based off "search results". Collecting may be one of them. I'll have to check tomorrow (well, today now). What I mean by this is that if you moved the Original Photo to a new location it may require us to "re-index" (update all the links) such that the collected images knows where the original now lies. In that case, it can take a few hours for them to update and re-appear. I don't recall moving Originals causing Collected versions to disappear but I'll check with the team when we're all in the office in the morning. One thing to keep in mind: if you moved photos from a Public or Unlisted Gallery into a new gallery that was Private, the collected images will no longer be able to be displayed. Setting the Original gallery back to Unlisted or Public should restore them. Though I see you've been in touch with the Heroes about restoring any potentially deleted Folders/Galleries/photos. Hiya Ana in Support is busy trying to restore everything after I sent an email to the support team today. It so far appears (I am guessing) that its related to the Phanfare subsites. So everything was migrated over as duplicates. So a folder of originals plus multiple folders that were the subsites - that migrated as "collections". And it would appear I didnt know which were the originals and which were the collections - and merrily deleted what I thought were simply duplicates when they were in fact the originals. (Again I am only guessing this). But sadly - as Ana has been restoring them - I can see I have to redo all my comparison and reorganising again which is a killer with so little time left before the Phanfare cut off. Plus some folders and galleries are still empty even after the deleted folders being restored - so I am at a bit of a loss there and perhaps thats related to what you are saying regarding re-indexing. One example link is http://karina.smugmug.com/My-Travels-To-The-Great-White-Land/Polar-Ponderings it has 7 galleries in it but only a couple have anything in them now. the rest are empty. But on Sunday morning they were full. I am not going to touch anything in my organiser for the time being - while Ana continues restoring the deleted folders and galleries, and you advise if it relates to re-indexing. And once everything is restored hopefully I can just put all those duplicates into one big folder and make it private so I never get tempted to accidently delete again!. Or is moving it all into a folder going to repeat the issue if its what you have said above re 're-indexing' ?